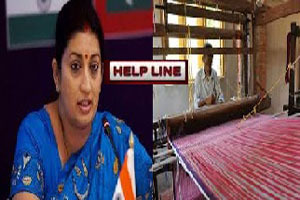 The Indian government has established a new helpline for handloom weavers called Bunkar Mitra. This was launched by Smt. Smriti Zubin Irani, the Union Textiles Minister of India. The line has been set up to help those in the handloom weaving industry. It is to help them with handling many functions relating to their jobs as well as resolving any kinds of disputes or other concerns that one might have. The hotline was set up through an online procurement process where the highest bidder was hired to help with setting it up. The MSD (I) P. Ltd. organization in Bhopal was chosen to be the agency that will help with setting this system up. The hotline will especially assist in improving the skills of handloom weavers around India. It will help them learn more about how to take care of a variety of tasks in the handloom field and what they can do to make their jobs more proficient. The line will also introduce workers in the field to a variety of new opportunities that they can take advantage of. This is to help make the industry more profitable and potentially useful for a greater number of people. Smt. Irani has praised the helpline for offering detailed information on all the different functions that people may utilize. This especially comes as the information is regularly up to date and offers plenty of information on all the topics and subjects one might need help with. The line will especially work in many industrial spaces. These include many fields dedicated to specific weaving tasks relating to shipping, producing raw materials and so forth. The Bunkar Mitra line is currently operated by 28 different Weavers’ Service Centres. This line especially makes it easier for people to access those centres. This is especially for those in rural areas that might not have access to one of these physical locations. Traditionally, there has not been any kind of single point of contact for getting solutions to various problems. Also, people have often had to personally visit their local centres for help. The Bunkar Mitra line has been set up to help people and to give them the solutions they need when taking care of various projects. Handloom weavers can contact this helpline by dialing 1800-208-9988. It is available throughout India and can be accessed from 10am to 6pm every day. It is also available in seven languages including English, Hindi and Tamil among other regional languages.